I’m on the play for our opening clash of Urza’s Saga, and open with a Swamp while Sam counters with a Forest. Next I bring out a Polluted Mire, which comes into play tapped. Passing turn, Sam then follows with a Mountain to bring online an Acridian. Now turn 3, I add an Island and pass. San pays the echo on her Acridian, then turns it sideways for the game’s first bit of damage. Back to me, a third Black mana source enables a Pendrell Drake. Back to Sam, she swings in again with the Acridian and I opt to block, thinking it a bluff and secure in the off-chance it isn’t that my creatures are just as happy in the graveyard. Sam’s got the trick, though, following up combat with a Shower of Sparks to the Drake to kill it, with another point going my way. I blunt the Acridian on turn 5 with a Despondency, while Sam’s turn is a blank. My next turn is as well, but once Sam’s rolls around again she blasts me with an Arc Lightning to keep herself at seven cards in hand. Down to 14 life, I draw Sandbar Merfolk on turn 7 and immediately cycle them, finding a Swamp. For her part, Sam adds a Goblin Patrol to the board. My turn 8 is equally fruitless, so after payng her echo Sam swings with both beaters. She plays a Symbiosis to carve off a larger slice of my life total, though I Power Sink it to only take 2 from the incoming assault. Now turn 9, I draw a Remote Isle. Although I’ve managed to put plenty of land into play, I’m still light one Island and so play it rather than cycle it, which I’d ordinarily prefer. Back to Sam, she tries to buff the Acridian with a Shiv’s Embrace, but I Power Sink that as well. Sam attacks with the Patrol, and I’m down to 10. Next turn I cycle a Polluted Mire, but find nothing of use. Sam summons a Thundering Giant and pounds in for 6. Looking to buy time, I stall with a Stern Proctor pulling Despondency back to hand, then recast it. Although I stymie Sam’s answering Argothian Wurm by sacrificing one of my lands, she doesn’t much need it. I scoop on turn 12 with a hand full of White cards. On the upside, I’ve hit my land drops as well, and so on turn 4 I’m able to bring out a Pendrell Drake. Back to Sam, she pays the echo on the Raptor then attacks in with it for 3. Now half-dead, I tap out to play a Sandbar Serpent. Sam then comes in with both of her creatures, and I block them both, an action that turns into a blowout when Sam again shows a Symbiosis. She then adds a Cradle Guard and passes. Now turn 6, an Exhume gets me the Serpent back into play, while Sam’s empty graveyard does her no favours. For Sam’s part, she pays the echo on the Guard, then turns it sideways for 4. I simply Expunge it. She replaces her loss with a Hidden Ancients and ends her turn. Next turn I Disenchant the Hidden Ancients, clearing the way for me to safely play a Diabolic Servitude to get my Pendrell Drake back from the yard. Sam, however, simply kills the Servitude off with a Hush, exiling the Drake in the bargain. Sadly, my turn 8 is a blank. Sam lays down a Thundering Giant, attacking in for 9. I block and kill her Raptor, but still go down to 4. In desperation, I play another Diabolic Servitude, this time fishing out my lowly Sandbar Merfolk. Sam attacks in for 6 to keep the pressure on, and I trade my Serpent for her Giant while chumping with my Merfolk. My Servitude comes back to hand, then Sam cycles a Smoldering Crater and finds a Pouncing Jaguar, which she then plays. Now turn 10, I bring back the Sandbar Merfolk with the Servitude. Sam turns her beaters sideways, and I block the Jaguar to kill it. I still take 2 to go down to 2, and Sam finishes me off with a Arc Lightning. Once more on the play, I open with a Remote Isle then follow with a Polluted Mire, figuring I’d get the drawbacks of the tapped-lands out of the way early since I had little to play. Sam, on the other hand, had no such problems, leading with an opening-turn Pouncing Jaguar, then attacking for 2 on turn 2 (after paying the echo). Now turn 3, I Catalog to try and improve my options, pulling two Swamps and pitching one of them. Sam plays a Shivan Raptor, then attacks for 5 to put me at 13. Salvation comes in the form of a turn-4 Somnophore– as long as I can keep him alive. Sam’s echo payment ensures she can’t burn him out before I can protect him, and she passes after another 5-point swing with both beaters. Down to 8 life, I counterattack in the air with my Somnophore on turn 5, opting to lock down Sam’s Raptor. When Sam comes back with a surprise Thundering Giant, though, I have to take the gamble and Power Sink it. She attacks with the Jaguar to leave me at 6 and ends her turn. Back to me, I attack with the Somnophone and lock down her Jaguar, then play a Sandbar Serpent. Back to Sam, she topdecks some burn with an Arc Lightning, killing off my Somnophore and throwing a spare point at me. Next she adds a Goblin War Buggy and passes. Now turn 7, I play a Pendrell Drake and pass. Sam cycles Scrap, then plays an Acridian and Thran Turbine. Back to me, I resurrect the Somnophore with Diabolic Servitude, then end turn. Sam places a Shiv’s Embrace on her Jaguar after paying the Acridian’s (reduced) echo cost. She then attacks in with the side. I kill her Raptor with my Serpent, chump the flying, Firebreathing Jaguar with my Drake, and let the other two through to put me at 1. Now at the end of my rope on turn 9, I draw a Remote Isle and cycle it, drawing- what else- a basic land. I concede the game. In life there are disappointments, and then there are disappointments. For us, perhaps the greatest of these were the decks of Lorwyn, as we’d long nurtured high hopes until we finally sat down to play them. The decks, I suppose, were fine more or less, but the gameplay wasn’t what we’d expected. For Tombstone, it’s an altogether different kind of disappointment, that of an opportunity missed. The decks of Lorwyn were only as good as the set permitted them to be, but the raw materials existed to make Tombstone much better than it was. Clear: Each deck has an artifact that’s nice to have an answer to in a reasonably-balanced Theme Deck environment, but did we really need three Disenchants? Clear fills the same place in the mana curve, hits the all-important enchantments, and has cycling. It’s exclusion from the deck is mystifying. Disciple of Grace/Disciple of Law: Although there’s no rule that says they can’t be used in more than one deck, it seems the mono-White Sleeper got dibs here, which isn’t the end of the world. Drifting Djinn: Now this was another glaring omission. 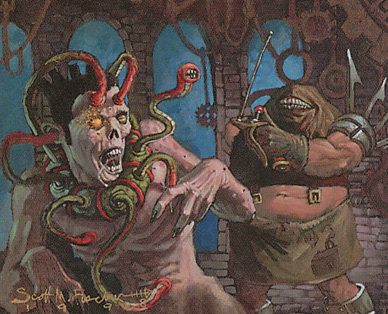 A reanimator/cycling deck is a novel combination with obvious synergies, but it’s a little hard to get excited about it when your biggest fatty is the Sandbar Serpent at 3/4. Since the Wizard’s Mentor “combo” with the Abyssal Horror is a non-starter, the Horror would have been an easy cut for the perfectly-fit Djinn. It’s a closer’s closer, and what’s more it has cycling to allow for some real reanimation tricks. Power Taint: Since this deck needs some time to set up, even a relatively nuisome enchantment like this might have had a use. Shimmering Barrier: Here, too, we see a strong stall card with cycling… and another mystifying omission. Here’s another head-scratcher: the deck runs twenty-seven land. This principle was explined by Mark Rosewater in a feature on the mechanic. One of design’s goals on every set is to build in a way to help players lessen mana screw. There are numerous ways to do this, allowing us to attack the problem in different ways, but it’s something we always make sure to put into each block. Cycling is one such mechanic. Why? …First, cycling cards can be cycled away with a low mana draw. This increases your ability to get land when you’re mana light. Second, it allows you a way to use your extra lands when your mana heavy. In short, cycling allows players to turn mana into cards. Or more accurately to allow mana to upgrade cards into better cards. As such, this allows players to run a heavier amount of land because cycling will over time help to readjust the skewed mana draw through the card utility of the cycling (or in English, cycling lets the mana from the extra lands you’re playing make up for the disadvantages of playing more land). This seems reasonable, but left unaddressed in the context of Tombstone is this: what good is cycling later in the game when you have a much higher chance of drawing redundant land? This happened more than once, and it was frustrating each time it happened. I could see the need for more land if the deck’s mana curve was heavy and congested at the back end, but this deck has a reasonable cost distribution. The deck would have been much better with 21 land plus one of each cycling land. The comes-into-play-tapped drawback would be little impediment, and you would improve your odds of drawing something useful when you cycled. Sure you couldn’t be as confident on a shaky keep, but that goes for most decks anyway. The deck overall wasn’t a lot of fun to play, and the wildly unfulfilled potential of the cycling mechanic really lets the deck down. It’s got too much unsupported garbage in it, like the Sandbar Merfolk we discussed in your initial writeup, and too little cohesion. Give this one a pass. Wow, sad for the potential that was missed here. I completely agree with everything you said about this deck and the Urza’s saga pool. I was thinking the same thing when reading part 1-what will you want to revive here? There is a little bit of an excuse since this is but one of the first set of theme decks released, and they did not necessarily begin with the best ideas. There was probably some concern about releasing a product that might give easy access to competitive cards for players, and thus discourage booster pack sales. Anyways, this deck seems like a waste of money, it doesn’t seem like a fun strategy at all. 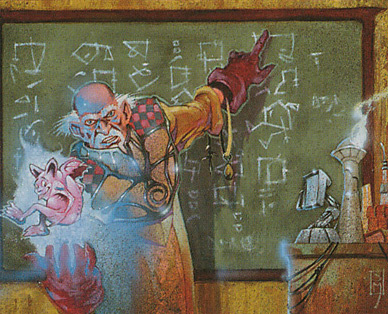 I wasn’t around when Urza’s block was legal but I am well aware of the inbalance of powers with the dreaded untap mechanic, in addition to the multiple broken cards-Tolarian academy, Memory Jar, Tinker, even things like Priest of Titania.